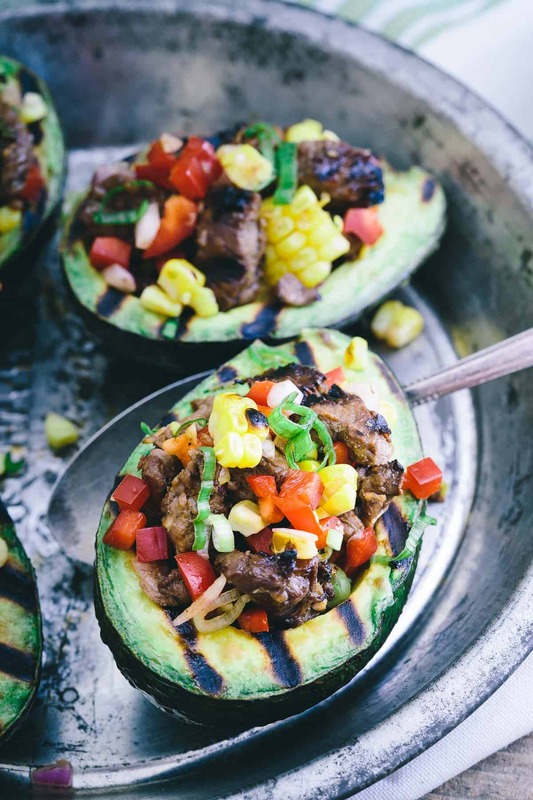 These grilled avocados are stuffed with Asian marinated steak, red peppers, grilled corn and scallions. Serve with a side of rice for a great summer meal! You guys, I’m officially obsessed with this summer. I mean, I love every summer but this one is really taking the cake. It’s been awesomely hot all the time (you will never hear me complain about a heat wave), we’ve been at the lake every possible day, bought a paddle board (hella fun! ), I tried (and successfully got up after about 6 attempts and about a gallon of swallowed water) wake-boarding for the first time last week, I’ve traded bread-like carbs for all.the.summer.fruit and have eaten my weight in berries and peaches alone and I’ve been using the grill for as many meals as possible. This is literally all I want out of life. Maybe just without the whole work thing thrown in between too. Too much to ask? Years past I sort of just ignored the grill. It was always there but I never really embraced its presence or I just made Ulysses deal with it while I prepared the rest of the food in the kitchen. No idea what changed this year but I just want to grill everything! 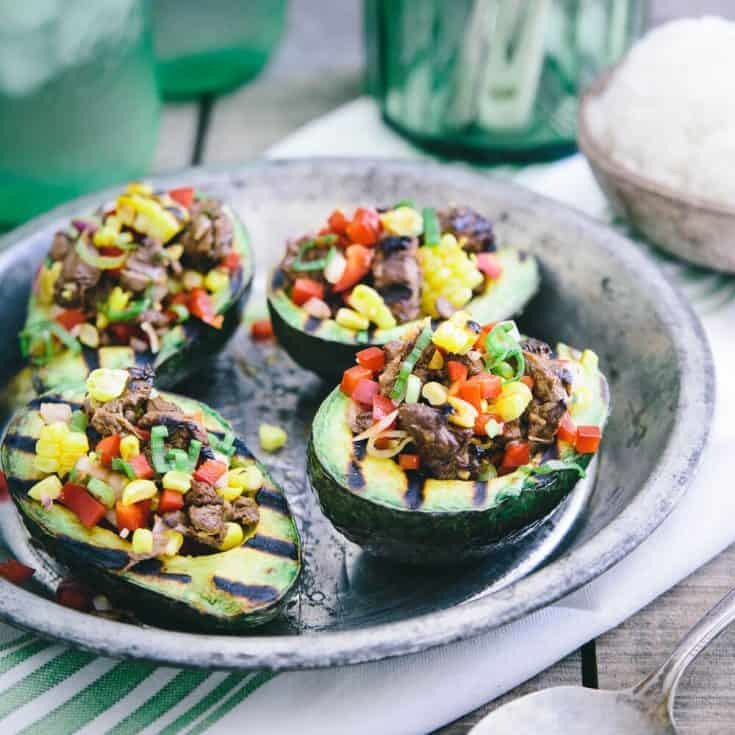 With California Avocados in season, this month is all about a “dinner en green” theme and I couldn’t think of a better way to celebrate the awesome little green fruit in July than by grilling it! Check out these other summery avocado dishes: zucchini pasta with avocado cream sauce, chilled avocado sweet corn soup and avocado sriracha egg salad. I’ve seen it done a few times and kept thinking I wanted to try it out but was a little turned off by the idea of eating the avocado warm. I’ve done the baked egg in avocado thing before and don’t really love the hot avocado flesh. Grilling it though gives the avocado this wonderful smoky taste that remains even if you let it cool down after grilling before stuffing and eating (which is what I did and prefer). The stuffing in these grilled avocados is equally noteworthy. The steak gets marinated with Asian inspired ingredients overnight then grilled as well and tossed with grilled corn, red pepper, scallions and red onion. 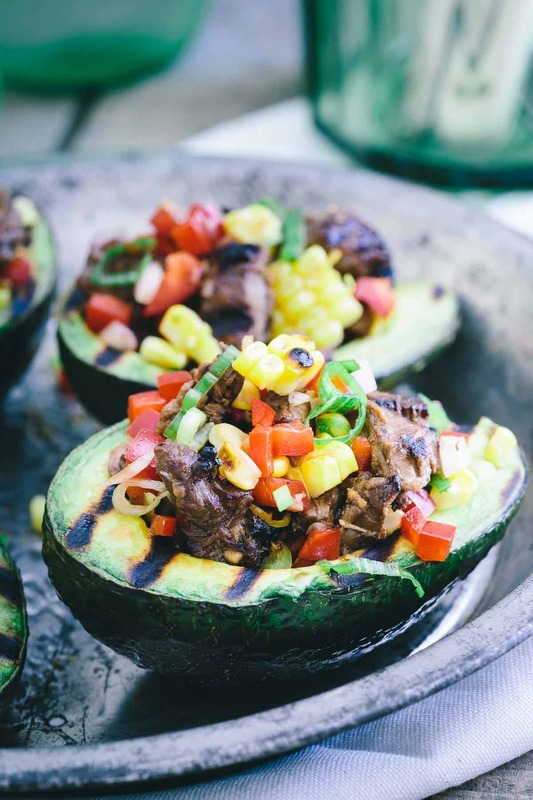 It’s incredibly flavorful and pretty much summer portioned into individual avocado boats. Keep it low carb and light and eat it as is or serve it with some rice for a more substantial option. Whisk together all the ingredients for the marinade in a bowl. Add steak, toss to coat, cover and refrigerate overnight. Place the ear of corn on the grill and cook until charred all around, turning a few times as needed. Remove from grill and let cool. Once cool, cut the kernels off of the cob and add to a large bowl with the red pepper, onion and scallion. Carefully scoop out each avocado half a little bit to create a slightly bigger cavity for stuffing. Brush each avocado half with the grapeseed oil then place on the grill flesh side down. Cook for 5 minutes on the grill with the lid open until grill marks appear. Transfer to a plate and set aside. Place steak on the grill and cook for about 2 minutes per side until grill marks appear and cooked through. Toss cooked steak with the corn, red pepper, onion and scallions. Spoon the steak mixture into each grilled avocado half. Well from the sounds of your summer, you should be obsessed. I was obsessed with living at the pool until it hit 100 degrees this week. And that sweat is just not pretty :) But these avocados, I could eat every day! LOVE! I LOVE grilled avocados!! I can’t wait to try this recipe! Your summer sounds like it’s been fantastic! I tried SUPing for the first time last fall, so much fun! This looks like such a flavorful and filling meal, perfect for summer. I’m glad you’ve embraced grilling everything! Loving these! I’m always looking for a new way to use avocados because it’s one of our faves and one thing the baby can easily eat and love. Oh my goodness these are calling my name! So perfect for summer!! 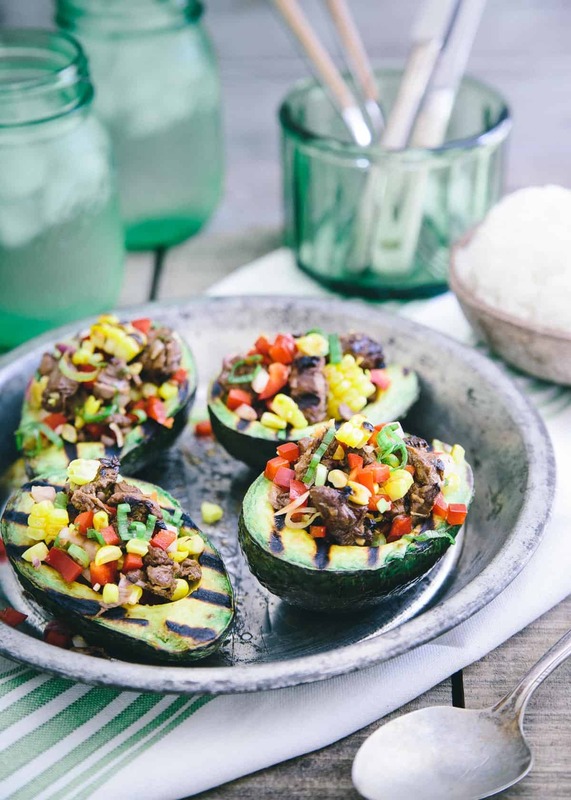 These stuffed avocados are spectacular! Perfect for lunch or dinner!! I have to try this amazing recipe. SUCH a great idea! Avocados are already so meaty and perfect, grilling them, YES. I love avocados! I have to try grilling them… yum. Stuffed with such great ingredients I have to give this a try. Its new to me, but I am totally obsessing over summer lately myself! The foods – the sunshine – outdoors and all of it! And of course, the grill! And these avocados – RIGHT?! I’ve never grilled an avocado Gina, and this dinner looks insanely delicious. Sounds perfect with the steak. And I’m so glad you’re having an awesome summer, it’s been a really good one here too. Grilling avocados is something I really want to do! These look amazing! 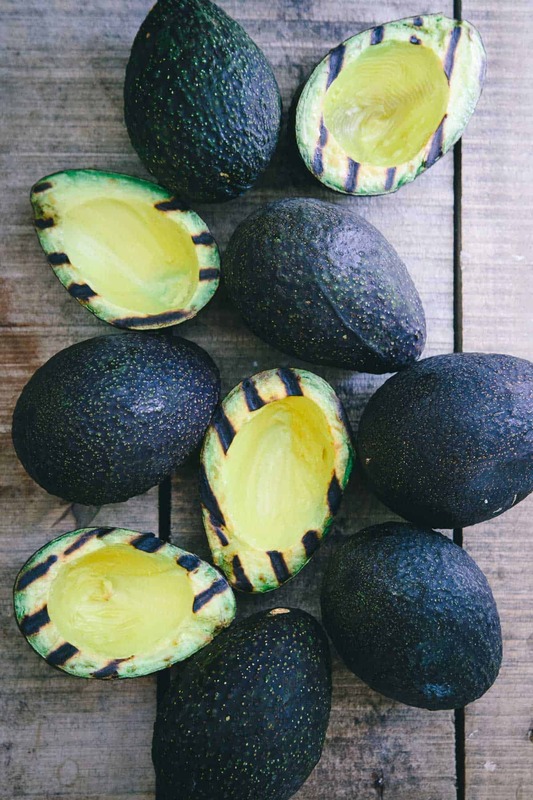 I can’t get over how gorgeous these grilled avocados look! What a yummy recipe! Pinning and dying to make! Always looking for new ways to enjoy my favorite vegetable/fruit/berry. Avocados are my go-to this time of year, so you recipe is on deck. It looks fantastic! Thanks, Candace :) Gets me excited for grilling season again! This is a perfect lunch idea! I love all the ingredients! Any suggestions on how to make without a grill??? The whole vibe of the recipe is grilled so it won’t really taste the same but you can just skip grilling the corn and avocado and cook the steak in a pan or in the oven instead.